I regret being paired with the writer I was paired with on essayservices.org. I had a simple request. My assignment was a brief analysis of a sociology subject. I had a killer topic, and all I needed was the writer to elaborate on it. For some reason, it seemed that my writer didn’t get my instructions. The whole paper seemed inaccurate and rushed; I had to do a lot of corrections to the piece after the writer gave it back to me. You don’t log onto these types of sites to get papers that you have to correct after you submit them to the writer. I was deeply disappointed with the quality of the writer’s final product. 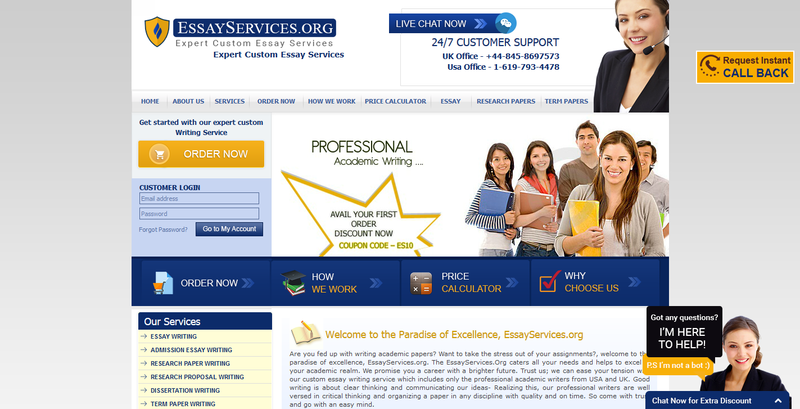 Essayservices.org makes it clear, as soon as you visit their site, concerning everything about their services. They have their prices listed, service options, and much more. The site itself is also incredibly easy to navigate. The main reason this section is rated so poor is that I can’t shake the thought of how poor my paper was. Even if it’s easy to use the site, it doesn’t mean anything if you don’t get what you want from it! Essayservices.org doesn’t have the best prices. While I talked about earlier how the site has its prices listed when you visit the site, what I didn’t mention was the high prices themselves. While great service and writing quality can often make a high-priced paper bearable, the quality simply wasn’t there. I certainly learned my lesson here; I won’t be spending lavish amounts of money on any sites likes this until I know for a fact that they’re actually as good as they make themselves out to be! The registration for the site was rather straightforward, as was the communication with my client and the support team. Therein lies the problem, however; I felt that, during several occasions, my questions weren’t answered with very much detail. The responses that were given to me by the support team almost seemed robotic. This was very worrisome; when I ask questions about a service I pay for, I expect them to be answered by humans, at the least. Who knows who responded to me! The delivery was the most positive part of my experience on essayservices.org. Like the services column, however, I can’t give a high score because the product that was delivered me was so bad. While the delivery of the paper was on time, that was the best part of my entire experience on the site. After all, a paper that’s delivered on time can’t make up for being poorly written. It doesn’t work like that! As much as I hate to do such a thing, I’m giving essayservices.org a dismal review. If you haven’t grasped the reasoning behind my poor experience, I’ll break it down for you part by part. Firstly, the quality of my assignment wasn’t great. Secondly, I had to do a lot of revising, even after I paid an exorbitant amount of money for the paper to be written. Thirdly, the support team was lacking, to say the least. I’d strongly suggest staying far away from this site if you’re looking to have a quality paper written. Heed my words – essayservices.org isn’t the best site out there.